On 13 January 2017, the Australian Government in collaboration with the Asia Education Foundation celebrated the Australia – India School partnership program dating back to 1998 till date in Hotel Sangri-la. 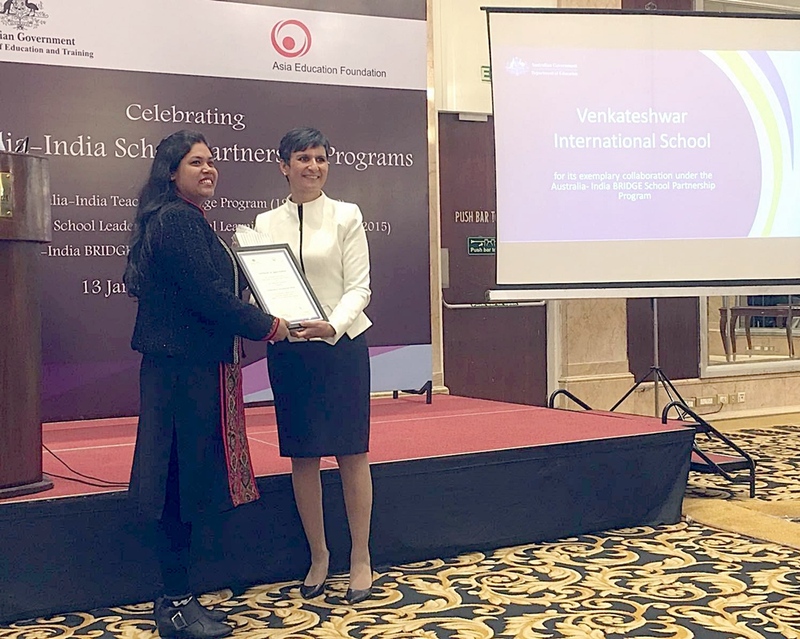 Venkateshwar International School was given the Appreciation award for exemplary collaboration under the Australia – India Bridge school partnership programme for a project on the Aborginal Dance form of Australia. This dance form based on the song ‘Into the forest’ was taught by Ms. Sharmon Parsons, dance teacher of the school of Total Education Warwick, Queensland to the students of VIS through Zoom sessions. The participants of both the school showed the dance to each other through zoom which was then combined into a video clip. Her excellence, Ms. Harinder Sidhu, the Honourable High Commissioner of Australia to India gave away the award.